It feels like so much--and it has--has changed in the past month. I thought I would take this journal entry to update everyone on where Everly is today. 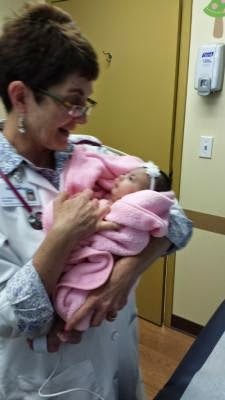 GI: They are taking care of maintaining her feedings, extra calories and overall nutrition. Right now we are trying to help her become more "regular" so her tummy doesn't hurt. We are also waiting for the go ahead to have the G Tube placed in her abdomen for feeding in place of the NG tube (nasal tube). Not happy about the procedure just because it is a procedure but it is the best decision for her based on her GI and Pediatrician's recommendation and we agree. Many factors played a role in our decision to do it but a few of them include: reduced risk of milk getting into her lungs, reduction (hopefully) in her reflux which causes desat's and aspiration, increased ability to learn to oral feed with nasal tube removed. Those are only 3 reasons but tremendously important ones. PEDIATRICIAN: We have a new one! We are thrilled to now be seeing one consistent doctor who adores Everly! I must give a shout out to her, Dr. Graham at Healthpoint Medical in Westchase, because she was literally an answer to a prayer. As of late, my prayers have been for clarity in decision making and discernment and compassion on the part of the doctors caring for Everly. And just like that, in a true moment of clarity, it occurred to me that I should contact Dr. Graham who I had met prenatally in January. At that time, I thought we were only dealing with Congenital Heart defects and she agreed to see her even still. But with our new diagnosis, I was not sure so I put a call to her office and within a couple of hours she (yes, the dr!!) actually called me personally. 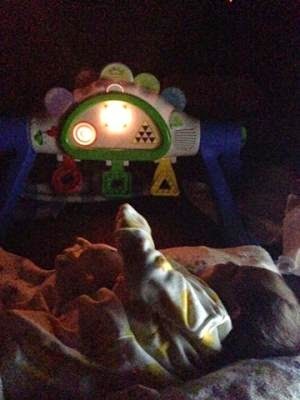 After explaining our situation, she told me that she had cared for babies up north with T18 prior and that she "would love to care for our Everly." Oh, what I would have given to record that statement! This past Monday was our first visit with her and our sweet pea received her first head to toe full and complete newborn check up. She finally was able to receive her vaccinations as well as get lots (and I do mean lots) of questions answered. She was in no rush to move us along and allowed us ample time to ask questions and fully answered them. The best part (really!) was that at the end of the exam she gave me and Everly a collective hug and whispered in my ear that "she is glad to be on this journey with us." I'm not kidding! God really orchestrated this one perfectly because she was exactly what the doctor ordered (pun intended)! CARDIO: Everly's last monthly Echo and EKG were both "good" according to the doctor. She is due for another repeat test of both May 12th. We are currently in prayer for either the doctor to open her mind and her heart in caring for Everly or for another cardio group who will. We invite you to be in prayer for this as well. PULMONOLOGIST: Left the St. Joe's area for this one and headed across the Bay on a recommendation to see Dr. Kriesman at All Children's Hospital. Good call! Not too much at the moment that he can do for her, but he did recommend a sleep study for her to determine if she has central apnea alone or obstructive apnea in addition. We would also learn if she's holding CO2 in as well (remember that time I picked her up limp shortly after we got home...we suspect that to be the culprit). So, we'll see about this study. THERAPY: The best part of the week! Everly began speech therapy (aka feed therapy in babies) last week at All Children's Outpatient in Palm Harbor. Love, love! 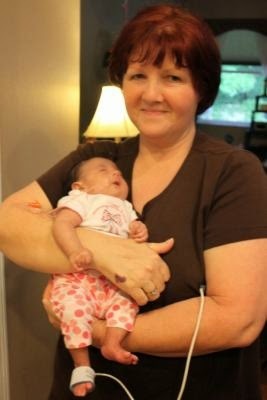 Ms. Kay is our therapist and works so well with Everly. We are just beginning so we have a bit of a road ahead of us but keep in mind that Everly doesn't take any milk by mouth yet. She only has taken literally a few drops over the past couple of weeks. The reason it's important for us to do this is so that when the time comes to introduce any baby food, she will have already experienced the sensation of swallowing "food" and the varying tastes, temperatures and textures to some extent. Without that, introducing anything else will be more challenging. 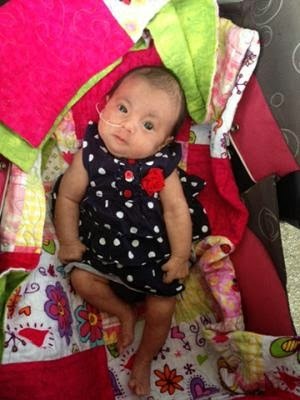 At the same complex, Everly also received a physical therapy evaluation last week. However, she did so well that the evaluation turned into an impromptu therapy session. Go girl! That was so fun to watch! I wish the family could have been there because I learned so much during that hour. So, she will now be receiving speech therapy twice a week for 1/2 hour and physical therapy once a week for an hour. Those will be fun appointments! It's hard work being that cute! In addition, we were notified yesterday that we have been assigned an Interventionist Therapist to work with Everly. As it turns out, she lives in our neighborhood and is a pediatric RN. The best part of the whole thing is that she's been following Everly's updates and progress and praying for her already prior to her being "assigned" Everly as a patient. God knows what He's doing, doesn't he? ODDS & ENDS: We continue to be advised by each of her doctors to keep her from enclosed places or large close gatherings. As hard as that continues to be, we do so knowing it's in the best interest of Everly. A simple cold her for her can turn serious quickly. Everly herself is so much fun to be with everyday. She has the cutest facial expressions and while she can't speak, her face can!She has a pretty consistent daily routine that I can tell she recognizes. Ala (our dog) continues to help me mother Everly even killing a bird and bringing it to the foot of the crib on day. Spent her 2nd birthday at Philipe Park in Safety Harbor with family. Celebrated with a cake and a gift. As for the rest of the family, I'll give you a bit of an update on us as well. SPIRITUAL: The boys have been able to attend church on Sundays thanks to my parents coming by and picking them up. I am able to watch the same service live online from the safety of the house with the baby. I've also DVR'd a gazillion Joyce Meyers Ministry and Joel Osteen episodes so I catch one of those an evening or two a week while feeding Everly (takes 45 min every 3 hours). PHYSICAL: Well, since our YMCA days are on hold, I knew we needed some movement. I have heard about the power of P90X for years now and decided it would probably be the best thing for us. So after a bit of research settled on P90X3 and figured we all could get something out of it. I knew it would be hard (only to find out after we started that hard is putting it mildly) but also knew there would be modification options on screen. We are now on Day 7 and we love it! It's such a great physical release not to mention a morale booster. Even Garren is excited and I no longer have to prod him to get dressed for a workout. We continue to do our nightly walks with sweet pea and our 2.2 mile hikes nearby but those don't count for our exercise really. SCHOOL: All I can say is thank God I had all my lesson plans complete prior to giving birth! That has made everything SO much easier and I'm not sure we would be doing school had I not done that ahead of time. I planned out Garren's year last July and Kendan's shortly after that. Then spent the summer and last fall copying and filing lapbooks, papers and units for the school year. So, I'm glad to say that some progress has been made in the past 8 weeks. However, we will be spending this summer catching up on a few things. With all her appointments, the mere worry of time the first 4 weeks and just the lost momentum with mom/teacher busy some, it's expected that we would need a bit of make up time. Glad we had that freedom to spend unlimited time with her at the beginning when we thought we needed it right then! I think that about wraps up all the facts and details that I know have been updated and changed since the last time I wrote about them. Thank you for all continuing to follow her story and her journey. I can't wait to see where God takes her and I'm thrilled you are along for the ride! Please continue to share her story, her FB page and her website. So many do not know of Trisomy 18 and it's important to educate. Why? So that eventually medical providers won't discriminate or withhold treatment just because a label has been stamped on their medical record. Not everyone fits in a mold and only God knows His plans for her, not even the best doctor can tell us that. So, how can you help? By sharing this page and sharing her FB page. 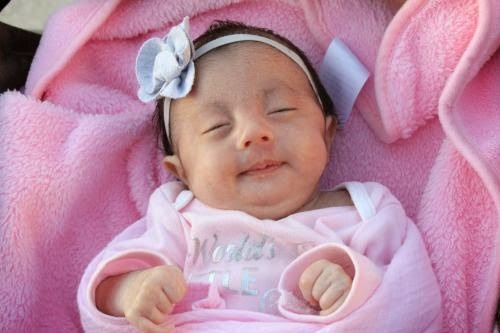 Let the world...everyone...see the face of Trisomy 18 and let them see that these sweet babies can thrive. 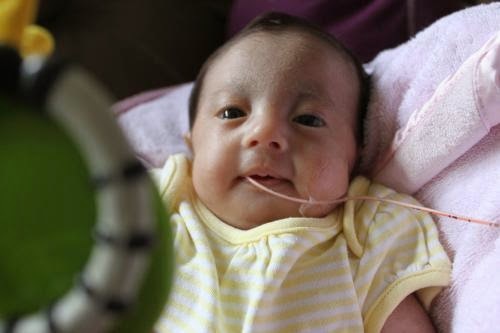 Help Everly get the care she needs by transforming the hearts of the medical community and enlightening those (me included at one point) who do not know about Trisomy 18. 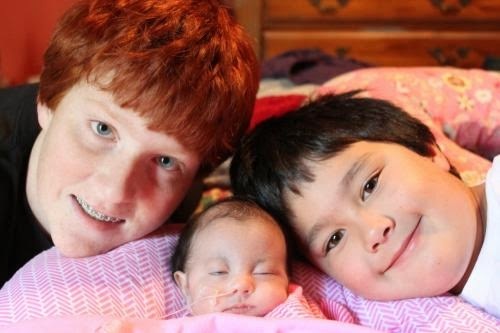 Please also pray for Everly's two friends Melanie and Elizabeth. 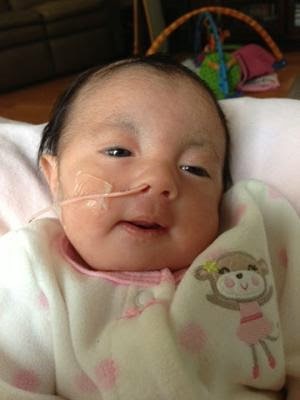 Melanie who also has Trisomy 18 will be having a procedure done this Friday. 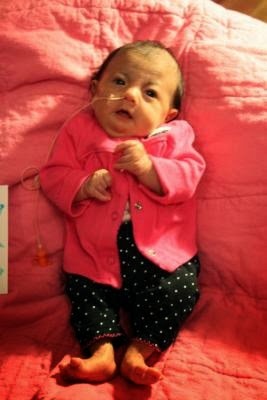 Elizabeth was born 2 1/2 weeks ago and has Trisomy 18. I haven't heard how she's doing this week but last week she was home and doing well. "Life is a Special Occasion"
I came across this quote today on the side of a Hallmark store bag. Prior to February, I would probably not given it a second thought. But stumbling across it this afternoon, it struck me as a profound statement. Life as a whole IS a special occasion. But we, in the hustle and bustle of life, tend to not take the time to stop and think about the sanctity of our everyday existence. The enormity of the statement has stuck with me throughout the day. I spent the rest of the evening reflecting on our past 8 weeks with Everly. Her favorite time of the day! First and foremost as we approach the celebration of her 2nd month birthday this Easter Sunday, I am in awe of the mere fact that our sweet baby born February 20 at 4 lbs 4 oz with a condition labeled "incompatible with life" is not only living but thriving. Yes, thriving. This girl is a fighter. She is strong. She is determined. She is still here and we are so blessed. My heart swells with pride at every hurdle she overcomes. Every stereotype she defies. Every milestone she reaches. She has gained two pounds in the last two months which for her is enormous. She is alert and responds to her family. 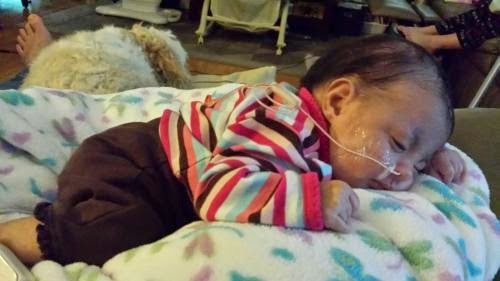 She overcame pneumonia and a collapsed lung...at home without hospitalization when she was just under a month old. 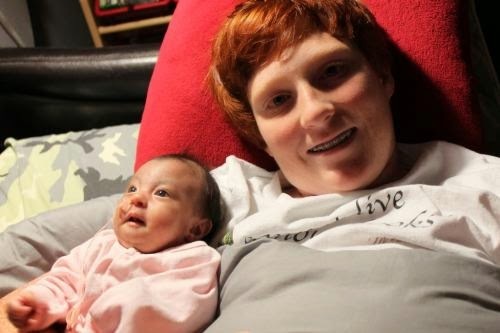 She somehow learned to swallow even though she's never taken milk by mouth. She amazes me. She was given this perfect life to live as only God intended and she's making the most of it. What a testament she is and how proud God must be of her! We have continued to celebrate each day of her life deliberately. We make sure to each devote time to her, talk to her and just soak her in as much as each 24 hour period allows. We make it a point to take her outside for a walk daily to enjoy the warmth of the Florida sun or the coolness at the end of a rainstorm as the case may be as of late. 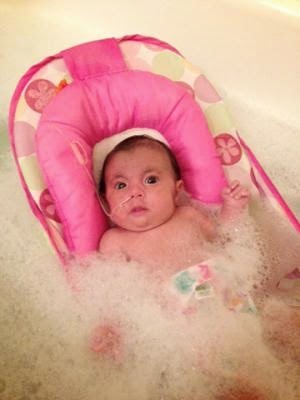 She receives her beloved bath each evening along with a massage or two. She has days full of love and attention. Her life is a special occasion to us each day. We continue to check items off her baby bucket list...sometimes completing them two, three or more times because they are so fun. We continue to shower her with experiences, outings (outdoor only still for her safety) and fun the way a family with two boys can. She is living a full life at a whopping two months old and I couldn't be happier for her. Cute little thing in her spring dress out for a walk! So, in getting back to this Hallmark bag and the quote on it, I am so glad that we are able to treat each day of her life as a special occasion. I don't know how many days she has. I don't know how many days my boys have. I don't know how many days I have. You don't know how many days you or your family has either. So, spend each day of your life like it's a special occasion. You'll be glad you did! Well, I knew it was a matter of time. As Isaac Newton has said...what goes up must come down. While this reference is related to the law of gravity, I believe it is also relevant in our situation. 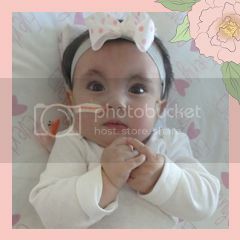 As of today's writing, Everly is a whopping 51 days old, just over 7 weeks of age and weighs in at 6 pounds 1/2 ounces. She has brightened each and every day, shown us how to live and be in the moment and has given us unsurmountable joy. Not one of us can walk by wherever she is without pausing to kiss or speak to her. The house is littered with toys, play mats, blankets, oxygen tanks and the occasional syringe or stethoscope. Our world, simply put, is complete with her in it. It's comfortable. It's whole. We know but we push aside those thoughts and worries about tomorrow. Unfortunately, as much as we do that, with each doctor appointment they so casually bring those fears to the forefront. Not so much out of callousness, I would dare to guess, but more so out of the nature of their "business" and duty. So, while we may enter the day and the doctor appointments with positivity and optimism for the future, we are quickly reminded the limitations of those hopes and dreams. With each passing day, we are more hopeful. With each doctor visit, we are more grounded. But we continue to hope. As we travel this road, we are cautious of our expectations. Not only for our own sake but for the sake of our two boys who might not understand the gravity of some of the decisions we must make. There's no manual handed out at the hospital that goes along with this diagnosis, there's no right or wrong. We each must do what we think is best and it does get harder because you aren't sure who to trust. I pray for discernment in choosing physicians. I pray for clarity in making decisions. I pray for strength to make it through tough days. So, my friends, what goes up must come down. That includes our emotions, our "good" days, our everything. We love celebrating each day...the sun on her skin during our daily walks, the way she gazes up at us, her warmth as she presses into our chest. We love celebrating her funny facial expressions...the way she squints her eyes as she enters the bath water, the way she scrunches up her face when she's unhappy, her calm face as she rests in the middle of the night. Yes, we do enjoy every single moment. But, some days when news comes at you, hopes are diminished, realization strikes, fear moves in...it is hard. We have all trust and faith in God that we are wrapped in His protective arms. We know His plan is perfect. We know that good will come. Lamentations 3:25 tells us that: "The Lord is good to those whose hope is in him, to the one who seeks him." Some days it seems dark out. Some days His plan isn't what I want. Some days I want answers. Some days I cry more than I can speak. Those are the days when what goes up must come down. My emotions. My strength. My faith. and most a God who understands where I'm at each day and loves me on the good and bad ones. ...that I am able to quickly replace those bleak days. Thankfully, it is through all this support that I have an uplifted spirit, find an inner strength I didn't know I even had and cling to a faith in God that until this trying time wasn't nearly as firm. For this, I am grateful. We are human. I know those times...be it a fleeting moment or an entire day or more...are to come...as all things that go up must come down. But I know that I am blessed to have support beyond measure and for that I say thank you. In my reading and research, I have stumbled across this beautiful poem that I must share. It says everything that I am not able. It is perfect...just as my daughter is. I could never say it better than that. I love my sweet Everly and everything about her. She is my Holland. Sweet Pea turned six weeks this past Thursday and today marks her 44th day birthday. What an accomplishment! I could not be prouder of the strides she's making. Afternoon stroll around the neighborhood. 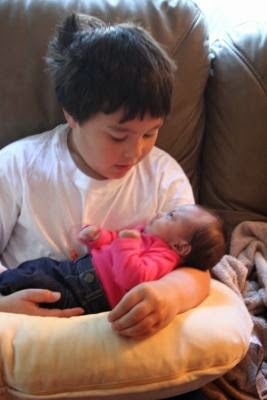 Her shirt says "World's Cutest Little Sister." How did they know?? When we first began this journey, we read all the literature, took note of all the statistics and mentally prepared for the worst right away. It's easy to do. The doctors and medical journals all make it seem that death is at the front door. However, all these days into it, I have realized that Everly hasn't read the literature, checked out the statistics and is not prepared for anything other than her next meal. All this to say, that while her diagnosis will not change, our treatment plan for her can and will. We are home under Hospice and will continue to be so as they are incredibly helpful. 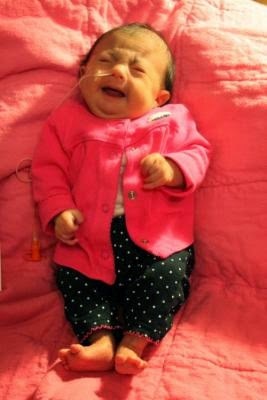 However, we are taking Everly's lead and are seeking ways to help her overall as opposed to just a wait-and-see plan. We have plans to visit a Speech Therapist in a couple of weeks who hopefully can help us teach her how to latch on for nursing. Again it will be only for minutes but precious minutes nonetheless and I will take every last one. 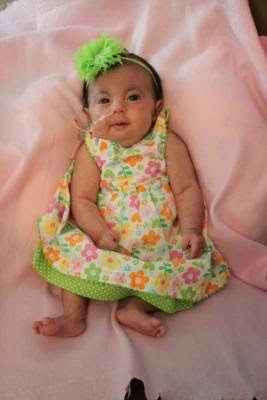 In order to assist Everly with this and to help keep her feeding tube in place, we will visit her GI doctor this Monday to transition the tube to her nose. I don't like this idea but would like to give her the opportunity to nurse and possibly take a tiny portion of her feeding via a bottle, though we fear that is very unlikely. The upside: to ensure the first placement is accurate, an x-ray will be taken and because of her small stature, we will get to see a current view of her lungs. The other upside: we will have this new and current x-ray to take to her pulmonologist on Friday. Physical therapy hopefully will soon follow speech. Our daily grind of twice weekly trips to varying doctors and specialists shall continue as we seek to help our daughter live comfortably and improve her life as much as we are able. The most exciting news for the week for us has been her heart diagnosis. No, there has not been an additional finding; rather, quite the opposite, in fact. I called the R.N. who is our cardiologist's nurse and asked her to read me the official medical diagnosis in Everly's heart. I knew the two major things but wanted to know the specific wording. When she read the three things the doctor had noted, I noticed that she left off Double Outlet Right Ventricle. I promptly asked her about it and she said that according the doctor's notes, once the PDA (Patent Ductus Arteriosus) closed after birth, it appeared Everly has more of a large VSD (Ventricular Septal Defect) alone than the Double Outlet in addition. Say what?? Just in case you left your Merck Manual at home, the Double Outlet is much more complicated and is significantly more threatening to her heart's ability to function. The nurse said we were told this in the hospital and it may have been the case but with all that was going on, it seems we missed this enormous piece of news. Regardless, we were beside ourselves with joy at the new "old" news. Aside from the mostly medical updates and doctor visits that seem to flood our weekly running tablet, we have also been continuing to love our little girl and give her experiences. 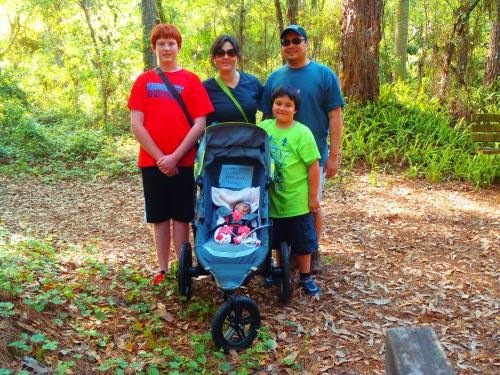 For example, to check off bike ride from her baby bucket list, we went on a family bike ride last Sunday through the neighborhood and to the park. It was a beautiful, warm spring day and perfect for such an outing. While I won't lie and say it was the easiest jaunt we've ever taken, I will tell you it was the most memorable. Yes, we did have to stop every few minutes it seemed to check her ever constantly beeping machine. Yes, it took us nearly 45 minutes just to get from the house and to the driveway packed and ready to leave. And, yes, it was a lot of work. But, it was worth every ounce of preparation to have the experience with her. 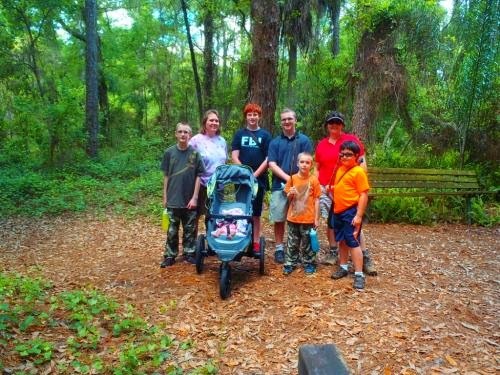 If you have not guessed it by now, you must know that our family enjoys and participates in mostly outdoor activities. So, to be able to take her along with her oxygen and all her machines on this special day outing, it was joyful for all of us. In addition to that big trip, we purchased a jog stroller for her this week. While we have a regular one, we needed one with all-terrain wheels so we can take her on our hike trail. With the weather heating up, I have been concerned about continuing to put her in my sling when we go hiking. Besides, laying her flat is best for her airway and her breathing. 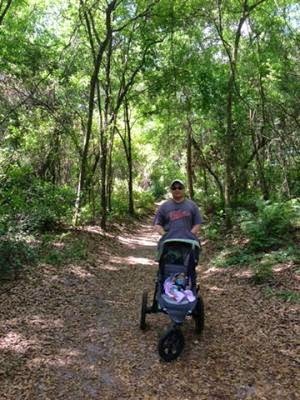 She wasn't sure about the bumpity bumps mid-way through the hike but at the beginning and in the end, they didn't seem to disturb her. Love getting her outdoors! Since we have the new jog stroller, we decided to spend the day at the beach today and enjoy sunset together. Again, the weather was perfect and fit for a beach outing...sunny and not one degree too hot. Just perfect. We did have to watch her very carefully today, though, as she continuously desated and we did need to give her 02 periodically. Normally she is well-oxygenated when we are outdoors but today she seemed to struggle with it. Thank goodness we are going to the cardiologist on Monday and will have a repeat echo (last one a month ago before we left NICU). 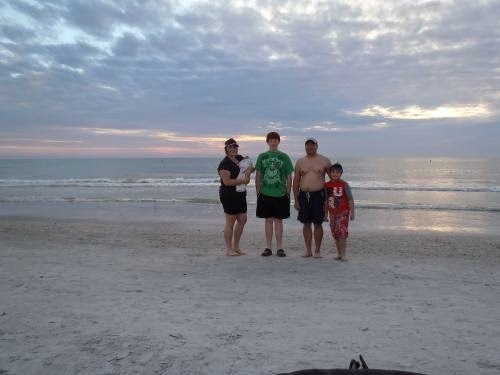 But overall the family did have a fantastic trip to the beach and enjoyed ending it with a coral pink Florida sunset. As I end this journal entry, please remember to pray specifically for Everly to have a good report from the cardiologist on Monday and that her echo is clear. Please also pray for comfort for her and for the discernment of the doctors treating her. Please pray for peace and calmness to radiate during this tumultuous time for our family. I also ask that you pray for Everly's new unborn friend with T18, Elisabeth Maxine Scholes, who is due at any moment. She has a CaringBridge site as well under her name. Please continue to share our website, her Facebook page Love For Everly (my friend, Courtney, who updates that has been out of town but we will have new pics and info again soon), and my FB page (Crystal Hopkins) where I tend to post my favorite daily pics now. Doctors have no answers why these genetic conditions exist and there is no cure whatsoever for them. Please help to spread awareness about this so little known condition so that more research can be done and the population in general educated. We didn't even know or had ever heard of T18. You know what you find when you google T18, but help our family and the entire Trisomy 18 family know what the face of T18 truly is. It's not a life filled with sadness and sorrow but rather it's a life of pure love and joy. That is what Everly gives us and we want everyone to know she's more than the medical journals say about her. She is perfect! Psalm 18:30 As for God, his way is perfect: The LORD's word is flawless; he shields all who take refuge in him.